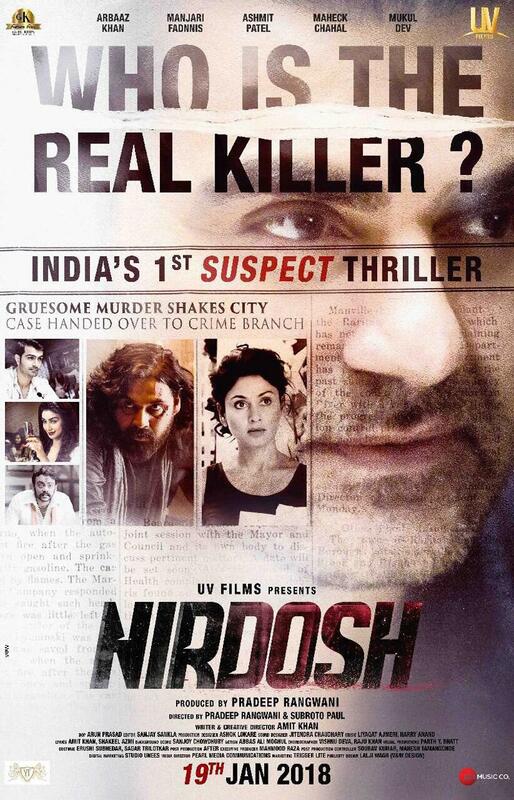 Featuring Arbaaz Khan in the lead role, Nirdosh releases today. Read its complete review on BollywoodMDB. Shinaya Grover (Manjari Fadnis) , who works for a media house, is arrested in connection with a murder case. All evidences are against her and hence it looks like an open and shut case. But as hot-headed Inspector Lokhande (Arbaaz Khan) takes over the case in his hand, new revelations are made, changing the course of the investigation completely. Now not just Shinaya, her husband Gautam (Ashmit Patel) and a couple of other people are also suspects of the cold-blooded murder. Is Shinaya really the killer or she is just being framed by the Police? Has Gautam killed somebody? If yes, then what was the reason? To know, watch the film. Arbaaz Khan headlines the cast of the film which also stars actors like Manjari Fadnis, Ashmit Patel, Maheck Chahal and Mukul Dev in important roles. Frankly speaking, Arbaaz has never received a warmth welcome for any of his films in a career that spans across two decades. He is not a crowd puller and certainly not the titular hero who can pull the film on his own. Here, he plays Inspector Lokhande, a rough and tough cop known for solving murder mysteries within blink of an eye. The actor goes overboard almost in every second scene and, at times, looks like copying his brother, Salman Khan. Ashmit Patel performs as if he has no interest in the film. Maheck Chahal is there to look hot and gorgeous which she does. Mukul Dev and Manjari Fadnis are good. So the film has been directed by two filmmakers, Pradeep Rangwani and Subroto Paul. And the moment you come to know that the film is a product created by two minds, you wonder how none of them could come up with genuinely entertaining stuff to keep the audience hooked. Nirdosh relies on a done to death formula without no fresh garnishing. Had this film been made in the 90s, it would have clicked the audience. But in today’s time, where the major chunk of the audience consists of the multiplex audience, the film is bound to face a brazen rejection. From cinematography to editing, everything in the film disappoints you big time and makes it a tedious task to sit though the whole movie. Throughout the film, you will find yourself wondering what made makers to splurge their money on such a production. Composed by Liyaqat Ajmeri and sung by Mohammed Irfan Ali & Palak Muchhal, ‘Saiyan Re’ is the one and only track you will see in the film. While you might like its picturization, the composition and lyrics are totally forgettable. It kind of reminds you of 90s music. There is no need to spend your hard-earned money on this run-of-the-mill film as it is not going to offer anything new and interesting. You can wait for its television premiere if suspense thriller films are really your thing. If not, avoid it as if it never existed. After launching brother-in-law Aayush Sharma, Salman Khan now introduces the leading lady of the film ‘Loveratri’! Check out the first poster of Maniesh Paul’s latest movie ‘Baa Baaa Black Sheep’! The nail-biting trailer of ‘Vodka Diaries’ is here and one cannot ask for a better suspense thriller!